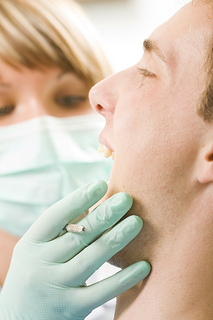 When snoring becomes more than just annoying: The dangers of sleep apnea Are dental X-rays safe? Snoring may not be something you take seriously. You might even laugh or joke about it. But the fact is, anytime you or your partner snore to the point of waking, it could be a sign of serious health problems. Sleep apnea is a sleep disorder that is potentially dangerous, and the most common symptom is loud snoring. Breathing repeatedly starts and stops throughout the night, and you wake up feeling tired. Other serious effects from sleep apnea could be potentially dangerous to your health if left unaddressed. Besides losing a good night's sleep, you may experience difficulty concentrating. Depression, risk of heart attack, irritability, high blood pressure, memory loss, sexual dysfunction, and chances of stroke all increase when sleep apnea is not treated. Sleep apnea occurs when the muscles in the back of the throat relax to the point of inhibiting natural breathing. The muscles used to support the soft palate relax and the airway closes, causing breathing to stop for ten to 20 seconds. This lowers the oxygen level in the brain. As the brain senses the inhibited oxygen levels it rouses the sleeper awake so the airway can reopen. Normally, the reawakening is so brief the person won't remember it. If you think you may have sleep apnea, visit our Pensacola, FL office and let Dr. James McCreary determine what treatment is needed. Without it, you could risk losing more than a restful night's sleep. Anyone can develop sleep apnea, but it is more common among middle-aged adults who are overweight. Dr. James McCreary can help you determine the cause and suggest positive treatment. A common treatment for apnea is the placement of oral devices that are designed to help keep the airway open. By bringing the jaw forward, the device opens the airway and thereby discourages snoring. We are experienced in sleep apnea appliances, and Dr. James McCreary can prescribe a fitted device and monitor its success with follow-up therapy. A continuous positive airway pressure mask, known as a CPAP, is among the other treatment options. A mask is fitted over the mouth and forces oxygen through the throat while you sleep. The pressure holds the soft tissue and throat muscles open. Our professionals at McCreary Family Dentistry can advise you of other ways to prevent sleep apnea, including weight loss, avoiding alcohol, or alternative sleeping positions. We can help you sleep return to easy sleep, knowing you are safer and healthier during your resting hours.